Home › Uncategorized › abuse › Friend or foe? Friendships are called support networks because that’s precisely what they are. They are our anchors through turbulent waters. We tell secrets and hear secrets, share news and spread news and sometimes are just together through the passage of time. Our friends know our faults and love us anyway. They understand our way and accept and accommodate it, the way we do theirs. In friendship we know we aren’t perfect but we are loved. Friendship gives us confidence in ourselves and in the world. “I finally have no friends left anymore. But worse than that I don’t want any. It’s just too complicated. He has flirted with some of them so much that they are embarrassed to see me anymore and I am threatened by them. Those friends have become “the competition”. Others have been labelled “a bad influence”. The people I have the most fun with are “the bad influence”. I don’t see them anymore because their existence has cost me his respect. I was stupid enough to allow myself to get caught in that trap. Somehow I felt like I was less in his eyes because they were in my life and so I sought his approval by neglecting and abandoning those friendships. People invited us to functions and he would be so aggressive and contentious that it was embarrassing. Then he would expect me to support his view and I could see their pity and their irritation that I showed so little backbone. There were stayers. They have become tired of seeing me cry and then run back when I have promised that this time I wouldn’t and couldn’t. They tell me over and over that I have become a “shell of my former self” and all I can say is that I know”. A friendship is an intimate relationship without physical intimacy and the abuser is a monstrously jealous husband. They cannot tolerate any form of intimacy at all. The intimacy of friendship is based primarily in honesty. Our friendship is the place that we don’t pretend. We admit to our fears and insecurities. We laugh at our failings and we don’t gift wrap our lives for presentation. The abused women cannot tell of her life. She hides the details of the fighting and the insults. 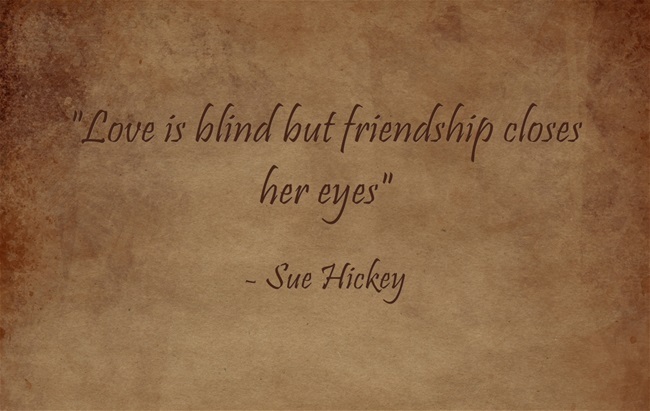 She covers up and in so doing she begins to break the unspoken beauty of friendship – its honesty. She hides her bruises and her welts, not because she is ashamed that she has them. She is ashamed that she is going home again. Her shame is of herself. “It is easier to just be pathetic than to know that there are people who know you are pathetic”. It is difficult for friends to watch the people they love floundering around and going nowhere at a rapid rate. However there are times when people and situations are beyond our reach. We cannot help them because they aren’t ready or able. However we can be around to gently pick up the pieces with them when they are. Let’s all be prepared to take the bus with our friends when the limo breaks down. Thank you for sharing your experience. My best friend suffers from her husband’s emotional and domestic abuse and it took a huge toll on our friendship. Her husband didn’t let her go anywhere with me or her friends, of which she barely had. He spread an awful rumor that we were lesbians which caused people to think differently of us at church. It was awful and disheartening to see a man fall to pieces of his own insecurities and see a strong woman of faith fall too. 😦 I keep in touch with her every now and then. I moved to another state but when I spoke with her recently, she admitted things still haven’t changed. Any words of wisdom for my friend? I so appreciate your concern. Sadly, her husband is behaving in true abusive style by doing whatever he can to isolate her from her friends. As a survivor of abuse, I understand how difficult it is for your friend to just get up and leave. It’s a process and until we are ready to make the move, all you can do is let her know how much you support her. I would be more than happy to talk to her if she is willing. She can also write to me at abuseendswhenyouloveyourself@gmail.com if she prefers. I’m sure she appreciates how much you care and know when I was abused, friends like you meant the world to me. Thank you for contacting me and please keep in touch. Hugely important topic! Well said, Philippa! Thank you! And thanks for introducing me to your blog – it’s exactly whats needed.